Gold Exchange Rate Per Ounce Differences – Where To Sell My Gold Jewelry? To find the best gold exchange rates the first step should be searching the web to find out what gold is actually selling for before getting written prices. This way you will be knowledgeable and a step ahead in knowing what price you want for your pieces. You should never sell for less than 75 to 90 percent per troy ounce of gold. To finesse your search visit a jewelry store that is individually owned and find out what the karat weight is in your jewelry. 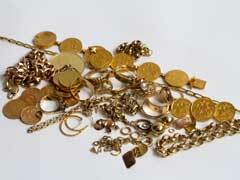 Once you know the karat weight, you can better determine what a scrap gold value should be. Do be aware that gold .9999 indicates that the piece is almost 100 percent gold. This rating is generally not applied to jewelry since a .9999 gold item would be far too soft to wear. There are hundreds of jewelry for cash or gold for cash companies both on the web and in brick and mortar stores. These types of stores often offer higher prices for scrap gold value since there is very little overhead. Watch advertisements for gold exchange and leverage your knowledge against theirs. Pawn shops do an extremely high business in gold exchange. They make loans on your gold property and you can either buy back your gold at a later date or sell it to the pawn shop. The prices you receive on your gold will be highly discounted and may not reflect what you could get elsewhere. One advantage is the quick turnaround in cash plus the no-questions asked. Selling your gold jewelry requires knowing the weight of your gold pieces. You can determine this by either having it appraised by a jeweler or by reading the jewelers tags which will indicate whether it is 14k, 10k or 18k gold. The higher the number, the more scrap value it has. The current price of gold is determined per “troy ounce” or a unit of measure equal to 31.1 grams. The day to day prices vary and the gold rate in the USA today is fluctuating around $1100.00 per troy ounce or $35.37 per gram. The best place to sell gold jewelry can be store fronts that advertise gold exchange for money. However if you have a jewelry piece that is intact they will be worth more than the weight itself. Jewelers will take into consideration the workmanship and offer you more for your piece. Depending on whether you want a quick turnaround in cash versus a higher value will be your best guide in determining where to sell your gold jewelry.